I’ve been working on a section about Eric Whitacre’s Virtual Choir, which began in 2009 when a 17 year old soprano named Britlin Losee sent Whitacre a video of herself singing his piece titled Sleep. Well, Britlin Losee is now a composer herself, I’ve learned. I just listened to two movements from a piece she wrote called Fate and Faith Songs, sung by the Women’s Ensemble of the Aaron Copland School of Music. Please listen to it here. She can’t be only 21. There’s a darkness and a joy there that just seems so impossible in one so young, except Rimbaud was only 17, so what’s age got to do with it! Her music has this haunting feel, it reminds me of the music in one of my favorite movies, Powell and Pressburger’s A Matter of Life and Death. But it also has this transcendent joy at the same time, that makes me think of the composer Tomas Luis de Victoria, whose compositions also always managed to sound happy even when he was writing about something sad. Anyway, I love that the young girl who inspired such a great thing is growing up and creating inspiring things herself now. 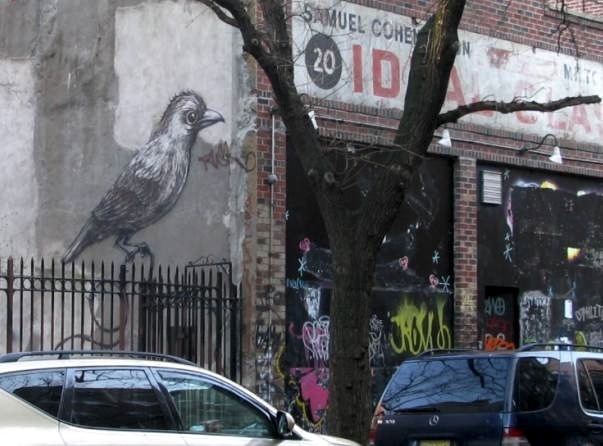 I took this picture of a graffiti bird near where I took the picture of the graffiti rat I posted the other day.